It is exactly a year since I first read about Duolingo and went there to have a look. 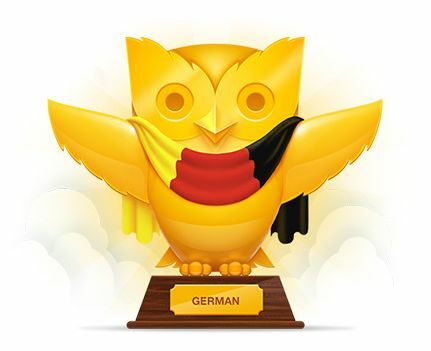 Today I finished my second "tree" on Duolingo—the German course—and want to share some experience and thoughts. First of all, I'm very grateful to Duolingo for the inspiration and strong addiction it gave me for learning languages. I said it before and won't hesitate to repeat again that Duo's design is a great pleasure for the eye, and the gamelike features make learning addictive and fun. I had absolutely no intention to learn any more languages (English is my second one) before, so it is only thanks to Duo that I took it up and did not drop it after a few days. I'm glad to see how Duolingo evolves. The team introduces new lessons, rearranges the skill order and works on better grammar explanations. The hover hints that help you understand sentences become more smart and sometimes explain grammar concepts. They are not perfect yet, but it is quite an achievement for a small team working on this site for just a year (yesterday was Duo's first birthday!). They introduced community moderators to help people and keep the forum clean, and I'm proud to be one of them. One of the "side effects" of being active in discussions is constant brushing up on my English. Duolingo's German course was brilliant in drilling the articles. Can you believe that I studied German at school for five years and did not learn the correct article cases? On Duolingo, I knew them by heart in maybe a month. This is where Duo's unforgiving method works the best: your answer is only accepted if it exactly matches one of the options stored in the database. You'll keep losing hearts if you don't know when to use "der" and when to change it to "dem" or to "den". It took me about 5.5 months to "conquer" the German tree. This is almost twice as long than I spent on my French tree some time before that. Well, I guess one can't remain over-enthusiastic with learning forever; besides, I still had to practice French, so German never got all of my "language time". (I gave up on Busuu which I regret a bit as it was very helpful for French and it should have been so for German, but I just didn't have enough time to take care of every resource. Besides, Busuu's design pisses me off and I hate to "sift through" dozens of members to find those who really want to learn and help others to learn.) Still, I studied every day and earned full "coin stacks" every day with the only exception of four days when we had a friend staying with us (hello Stephen if you're reading this!). You can see my "streak" of 142 days on the picture, it means I've been studying for the last 142 days without missing a day. At first, I moved rather quickly and learned a lot every day. After a while I realized that I don't remember German words as well as I do French; at the same time I found a discussion about redoing every lesson until you get full hearts (i.e. until you manage to pass the lesson without a single mistake). Surprisingly, quite a log of Duolingers did just that. I decided to follow their example and redo every "non-perfect" lesson I had. It took me about a month to accomplish that task. After that I went on very slowly, learning one or two new lessons a day and practicing "old" skills a lot. Thus I passed about two thirds of the tree. 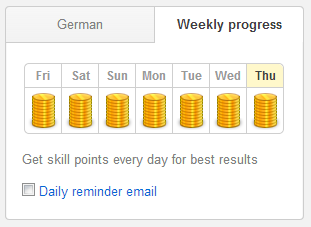 Unfortunately, I have to say that Duolingo's effectiveness drops towards the end of the course. Learning by translating random sentences is great at first. My mother has a cat, I eat soup, You are writing a letter—this is all very straightforward and easy to translate word by word. When you learn more complex words, however, you need context. Random sentences become vague and you struggle to remember the new words and the translations accepted by Duo. Sometimes there is an article in German but it fits oddly into the English sentence, and you have to guess what Duo wants: a literal translation with all the articles or a more "natural" translation without some of them. Die Zukunft der Bildung—is it "The future of education" or "The future of the education"? Of course I reported every mistake I saw and suggested to accept my translations whenever I was sure they were good. Even so, I don't think it is fair to penalize users for bad English when they are learning German, but how to avoid it when it is a program that tests you and not a teacher? At some point the method of learning by translating checked by the program becomes less effective. Okay, but why didn't I give up Duolingo if it is not very effective? The answer is simple: it is addictive. I wanted to get my owl trophy and to keep my streak, so I kept doing exercises and earn a full "coin stack" every day. No other method can keep me motivated for so long. I use a textbook for French now: the course is very effective and polished, every little thing is thought through and the exercises are arranged so that you can do without actually learning the words because you remember them well with practice. But it is not a game, it is not fun, and I have to force myself to study every day. It would be hard to do the same for German, and I'd probably just give up learning it. I passed through my last third of the course again very quickly. I did not stopped to practice because I felt it would be not only drilling new words, but also drilling the exact acceptable translations, which is just a waste of time. It is also a waste of time to memorize sentences that I don't understand well due to the lack of context. I'm sure I'll learn much more and easier if I move on to reading texts instead of sentences. What's my German level now? It is really hard to say because I don't use it in "real life". When you live in Russia, the only way to practice German is to find some friends or language partners on the internet, but I just don't feel like doing it now. I was learning just for fun and I'll maybe switch to reading for practice as I did with French. By the way, a year after beginning to learn French from scratch I'm almost at the end of "Le comte de Monte-Cristo". I read this book numerous times in Russian when I was a teenager, so now I don't have to struggle with the plot which I know very well. What's next? 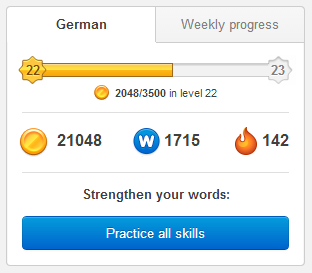 I think I'm going to practice German or do some translations on Duolingo for a while. Then I'm going to take a break in learning languages; I'll continue practicing French and German with reading if I can manage both.